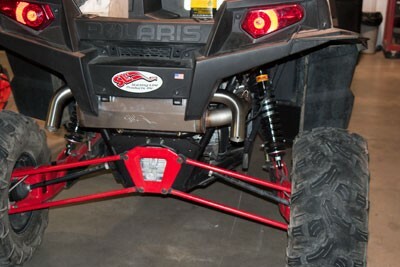 This Slip-On Muffler for the Polaris XP 900 RZR delivers an additional 4.2 horsepower with well over double the air flow compared to the stock silencer. This translates into a substantial performance increase and better throttle response. Its stainless steel construction provides excellent strength and durability. The sound level measures 95.5 DB (@ 4200 RPM) using the SAE J1287 sound test. It also features a spark arrestor that can be added for trail use. 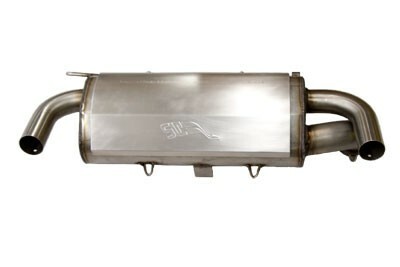 This is the same muffler found on the 2013 Polaris Jagged X. Note: For optimal performance use in conjunction with SLP High Flow Intake Kit, Power Commander V Fuel Controller with SLP mapping~ and SLP Clutch Kit. 2014 All Rights Reserved. Starting Line Products, Inc.